The product was as described. No issue with the product. For the price I was a little surprised at the high quality of this item. I've paid a lot more for inferior products, particularly the screen protector which fits better than any screen protector I've used before. Great case for the phone which feels it will protect against drop. The screen protector looks good when it is on the phone. It does give a bit more screen glare but not too bad. The smoothness of the screen when gaming can be cause grease build up and effect touch sensitivity so needs a quick wipe with extended use. The case itself looks amazing, all the buttons work with the case on which I found to be a huge problem in buying phone cases for other phones I've had in the past & offers good protection for the back of the phone. However, the case would not cover a drop where the phone is screen down. This wouldn't have mattered if the screen protector was of a better quality however it has already started to crack from a few minor falls, so now I have the task of removing the screen protector & then the case not covering a fall with the screen facing down. Also I found my touch screen to be less accurate & at sometimes it doesn't read me touching the screen at all. Summary- Looks stylish with a sleek finish, could offer more protection so a screen protector might not be necessary. Nice case, screen Protector broke right away. Case does the job, screen Protector cracked right away. First order didn't show but mobile fun couriered another right away, kudos to mobile fun for stepping up. Great case that affords a decent amount of protection and looks very tidy. It even comes with a screen protector that would normally cost almost as much as the case. The case and general quality is excellent but the screen protector doesn't work - it stops the touch working unless you press very hard. Kit is complete including everything required for application of tempered glass. Once glass & case are installed, the combo offers full protection of device. Solid case and not bulky at all. It only got a star because of the screen protector. Case: It looks great, but it is so thin, it will not protect your phone from anything but dust. Even a small everyday drop on the table will damage your phone. Screen Protector: Very bad sensitivity, I could not use PENUP to draw with my SPen because the screen protector is detecting input all over the place. I have not drop tested, but I do not think it will last more than one drop. Easy installation, very little impact to touch sensitivity, Slim and good looking cover. Quick shipping as well. Value for money, recommended. Easy installation compared to traditional screen protectors, no impact to touch sensitivity and cover is slim and nice too. Recommended. This note 9 phone case fits like a glove. Not too tight or loose. The glass front was easy to put on using the included instructions and materials given. Being glass, it gives great visual clarity and it's easy to clean. The back and sides of the rubber part of the case is fairly slim which I like since this is a big phone. If you want more protection then maybe go with something bulkier. But I think this case will give ample protection anyway. The only thing that might be a concern is that it collects some dust around the edges where the glass meets the rubber. Simply taking the back off and cleaning once in a while is a simple fix. All of the holes and slots line up perfectly. The buttons need only a slight more pressure to work properly. You should turn the sensitivity up as well so your phone can "read" your gestures etc better. I'd buy this case again for sure. The case was a sloppy fit...I ended up purchasing another case. The case is nice, looks sleek, isn't bulky, feels nice on the back, and protects the corners/edges. Won't protect the front from impact, but that's pretty clear from looking at it and I wasn't expecting it to when I bought it. The screen protector is not great, but serviceable. Definitely reduced responsiveness but thankfully the Note 9 has a setting to make your screen more sensitive just for that purpose so it was fine. I did notice the dots that more expensive protectors advertise as not having, but only at certain angles. The protector is not full adhesive, only the edge, so I found that my dog's hair liked to stick to it, which was a minor annoyance. On the positive, I dropped my phone on it's face onto a tile surface and the screen protector did its job, breaking in a few spots, but saving my phone's screen, which would have certainly been damaged without it. I've since replaced it with a more expensive one, but would buy this one again in a pinch. This one was certainly easier to install than the whitestone I replaced it with. I should have heeded the other reviews - the back case is too large for the phone so comes off easily, especially if dropped so that is essentially useless. The glass does not seem to be a snug fit to the profile of the phone either, and can easily catch on things and be pulled off. I would have expected the back cover to catch the glass in it, but the two do not meet. There are no sensitivity issues with the glass, but it shows fingerprints horribly and looks awful. I am trying to get a refund because the case does not do what it is designed for (protect the phone) because it does not fit properly. Easy to put on, but as with most cheaper screen protectors, the adhesive is only on edges and am already having hairs and dust coming between screen and protector. The screen protector is like a magnet for finger prints, like incredibly bad. Additionally, even with touch sensitivity increased there are still noticeable issues with screen responsiveness most likely due to screen protector not being affixed to glass. Overall disappointing. Fit is good. Brushed texture back feels good in hand. Could have had higher raised edge to allow for phone to sit off of surfaces when face down. Slight misalignment of holes at bottom and buttons are a bit hard to press but not a deal breaker. The case fits really well and comes with a tempered glass screen protector both of which are of high quality. The screen protector is crystal clear with no touch sensitivity issues. The only issue I have is that when the screen is off the screen protector is a bit shiny and shows finger prints. Have always been looking for nice and practical bundles from MobileZap (the Australian site for MobileFun), and this bundle did not disappoint. The cut of the screen protector is accurate and the case feels great in hand. Practical for protection, no fuss installation, value for money. No complaints. Hello Day1 Olixar team, thank you for the opportunity to provide customer feedback for your Note9 Sentinel case & screen protector kit. 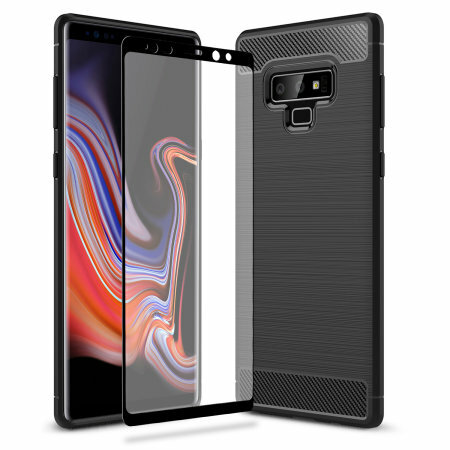 - Unfortunately, I do not feel the Sentinel case product for the Note9 aligns with the fact that the Note9 is a “ best of breed” flagship mobile device. This however is constructive criticism, and I’ve taken the time to provide it because I believe in the Olixar brand. You can do better and hopefully will value the feedback and fix the product. -	Packaged OK, but lacking. -	I used my Note9 for a full week before fitting your screen protector, the naked screen is just excellent to use. -	I took exceptional care cleaning the screen before fitting your protector, no dust and no chemical residue. -	I applied it well and smoothed outwards from the centre of the screen to the edge adhesives. That bit went fine and it looks good. -	The edge adhesives are not great. They ‘creak’ a bit on two of the edges. -	The biggest issue though is with sensitivity. It’s really bad. Like %20 decrease bad. -	Mostly a second harder ‘peck’ on the screen is required with this protector. It’s nothing at all like the sensitivity of the native Note9 screen. -	After using the Sentinel screen for a whole week it’s very apparent the protector is not oleophobic. It highlights fingerprints in a way that is completely opposite to the phones naked screens excellent coatings. -	Lastly, cosmetically, the edge black-outs are too ‘shiny black’ and cheapen the look. A deep charcoal or matt would suit the look of the Note9 much better. Guys, The Sentinel screen protector is letting your brand down. The experience leaves me not trusting any glass screen protector, wanting to rip yours off and buy something like a premium plastic film or the WhiteStone Dome Glass protector. Thanks for the opportunity to relay my ‘end user’ experience. I hope you take this to your product development team to improve the Sentinel product and release an improved version. – when you do, please let me know ???? I love that it comes with a screen protector and a case. The case is nicely textured and non slip even when wet. My friends all noticed that immediately when they picked up the phone. The glass screen protector was simple to apply, JUST FOLLOW THE INSTRUCTIONS. Fast Delivery, Easy to use Product, Great Quality! Very easy to install the glass screen protector, the case fits perfectly with it, product is of a great quality. the screen protector fits and sticks well with the case on. But the typing is not responsive, so you cant actually type very fast because of a delayed response. The delivery was very good, nice and prompt. Any further issues, please contact our Customer Services team. Bought this for my brand new phone, screen protector very bad quality, cracked after 2 days. The grip is nice, it protects the phone well, it's light and doesn't really change the look or size, which is nice. The glass cover gives a nice protection, the only down side, is that you have to press down harder on the screen as it loses quite a bit of the sensitivity, which isn't good. So far so good.. Glass screen fitted first as instructed. This is a good product, I turned the intensity up as hinted by mobilfun and was surprised by just how good the sensitivity is. Fitted the back cover which I thought was a little flimsy. Once fitted however it seems to do the job very well. All the buttons and holes are accessible . The only thing I havn't tried yet is throwing the phone down and bouncing it about but I feel confident that the phone will survive such an experience. I understand I received this item when first released and therefore the longevity question will be answered in a year or so. Great product so far, wonderful service from the mobilefun team and excellent delvery. Bought this package to protect my new shiny phone. Screen protector is awesome stick as should and covers the screen greatly but does not go well with my second case :( . Very nice appearance with minimal bulk. The edge could be a little higher to keep screen off surfaces and the fit could be a tad tighter as it feels like the phone could pop out at any time. Be careful to align the top very careful or iris detection will be sluggish, perhaps their other screen protector with the larger central notch would be better than the included one. The screen protector on the front is awfully you can hardly use the phone to type and it doesn't work properly with facial / iris recognition. This was a sheer waste of money!